March 17, 1981: Moondogs Rex and King won the WWWF tag team titles from Tony Garea and Rick Martel. May 1981: Moondog King had some work visa problems, so he dropped out and was replaced by Moondog Spot. 1983: Moondogs Rex and Spot had some memorable matches in Memphis including a feud with the Fabulous Ones. Most fans may remember the Moondogs as the catalyst team for Paul Orndorff’s betrayal of Hulk Hogan. ~~~Hulk Hogan and Paul Orndorff defeated Rex and Spot, but Orndorff’s jealous got the better of him. 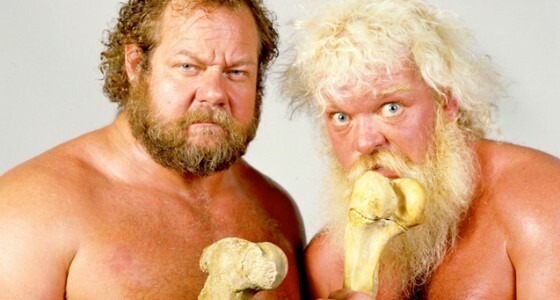 Moondog Spot and Moondog Splat (working as “Rex”) wrestled for Jim Cornette‘s Smokey Mountain Wrestling. During this stint they had a feud with the Bruise Brothers. There was a female Moondog “Fifi” who wrestled in the United States Wrestling Association.